Tone circuits for use with nearly all basses that will replace your tone knob and create a more efficient sound, such as low noise, low distortion, and high headroom. Basslines STC-2C-BO Blackouts Tone Circuits are for nearly all bass guitars, due to their selectable treble frequency. You can use Blackouts Tone Circuits with either active or passive bass pickups. STC-2C-BO Blackouts onboard Tone Circuits add tremendous tonal versatility. Use them to add or subtract EQ at center frequencies voiced specifically for the electric bass. Blackouts Tone Circuits offer low noise, low distortion, and high headroom. In addition, they are voiced for use with Blackouts for Bass Pickups, but with their switchable treble control, they're useful for all musical styles and genres. The lows are deep, clear, and tight. There are 2 treble frequency centers to choose from. The lower setting is perfect for adding growl and bite to traditional P (precision), J (jazz), and MM (music man) bass tones. The higher setting provides a crystal clear top end to modern-sounding, full-frequency bass tones and when used with Blackouts for Bass Pickups, gives punishing clarity without brittleness. 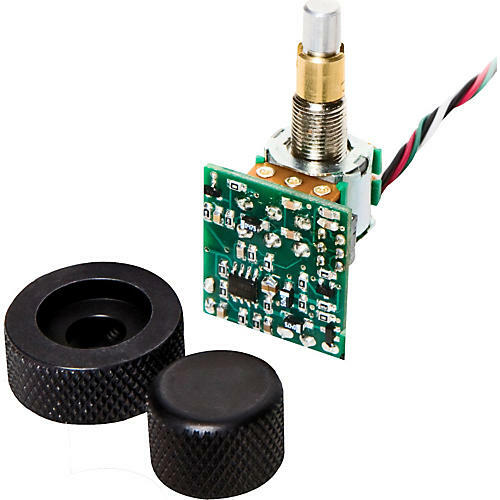 The STC-2C-BO is mounted to a concentric potentiometer, which can replace your tone knob with no need for additional holes in your bass guitar. Basslines includes all necessary mounting hardware, such as: high-quality potentiometers on a pre-wired harness; a battery clip; a stereo jack; and black anodized, knurled, dome-style knobs.